Pop quiz – why is coffee’s favorite time of year NOW? Because all the stylish creamers come out, ready to give coffee a major flavor makeover. I’ve been craving a sweet and tasty creamer that doesn’t have the typical junk of ingredients. So that’s why this coffee lover created a paleo & vegan Snickers coffee creamer. I be roaming through Target like a boss, giving rows and rows of processed creamers the ‘WHATEVER’ hand gesture (yes, Clueless was my guilty vice in 7th grade). ‘Cause momma created something better, something simple, something so decadently delicious without the impossible-to-pronounce stuff. And although all the holiday flavors kind of give me those giddy heart palipiations in anticipation for my favorite time of year, Snickers is year-round. So you can enjoy this treat 365 days. BOOM. Creamer can be a HARD thing to give up if you’re trying to go dairy-free or follow a paleo lifestyle. Black coffee is great and all, but flavored creamer makes every morning rainbows and butterflies. 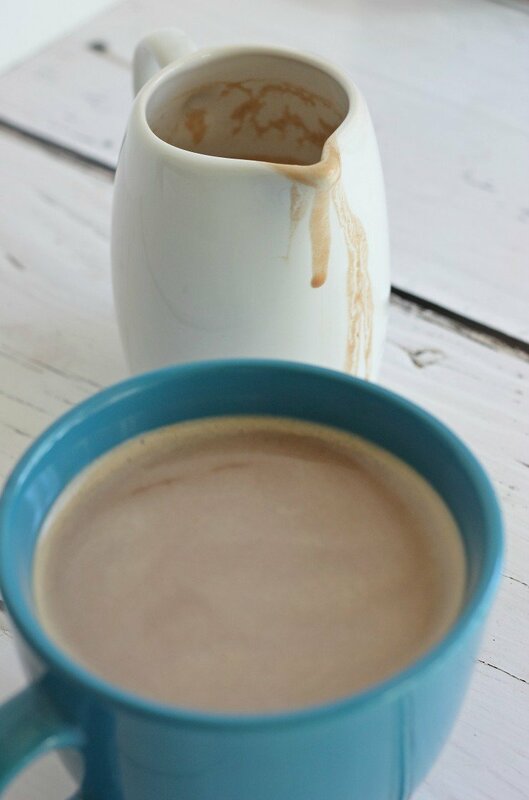 This paleo & vegan Snickers coffee creamer even makes Monday mornings great. Like jump-out-of-bed-Christmas-morning style because you are soooooo excited. WHAT’S EVEN MORE AMAZING (making me type in all caps) is making this creamer in less than 5 minutes, with a few simple ingredients. That is snick-tactic if you ask me. Then store in the refrigerator 7-10 days. You’ll never ever ever have to go without a nummy coffee booster again! It kinda makes me want to bust out my inner Alicia Silverstone and give black coffee a big ‘whatever’ hand gesture too. 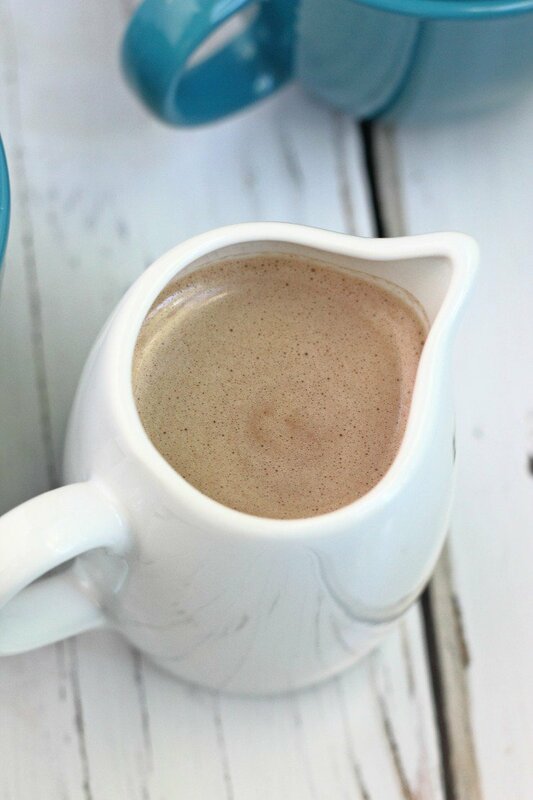 All you need to make this paleo & vegan Snickers coffee creamer are medjool dates, cocoa powder, almond extract, and coconut milk. I know what you’re thinking, “crazy woman, Snickers is made is caramel and peanuts.” I knoooooow silly, but we are improvising a bit. The dates act as a sweetener and make up a paleo version of caramel, while the almond extract adds a touch of nuttiness, in lieu of non-paleo compliant peanut. The coconut milk makes this creamer extra extra creamy – because no one wants thin, runny creamer. No bueno. 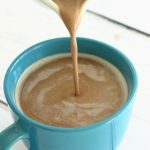 Do yourself a favor and ditch that store-bought junk and try this paleo & vegan Snickers coffee creamer asap! Serve it in your morning coffee alongside this paleo apple bread with caramel maple glaze or this caramelized onion and butternut squash crustless quiche! Such a great idea! I love the flavored creamers at this time of the year, but I’ve been giving them the hand too because I don’t love the ingredients. I NEED to try this! YES YOU DO! And I pinky promise it’s so easy Blair! Enjoy my friend! If this actually taste like a snickers candy bar I am in big trouble. Creamers are so easy to make. It’s a ‘version’ 🙂 Like I said, I used almond extract in lieu of the ‘peanuts’ to keep this paleo-compliant. But I’m sure you’ll love it anyway Candy! I normally just drink my coffee black but THIS looks amazing!!!! I would love this for a special treat 🙂 Maybe I’ll make this for the holidays! Totally a special treat kind of recipe. Which you totally deserve! Thanks! I think Snickers and coffee together just seems like a match made in heaven! You totally can! It’s so easy too! Thanks Deborah. I’m not too big of a coffee fan but if it tastes like snickers… I might be swayed! Hmmmm I hope this does sway you girlfriend! 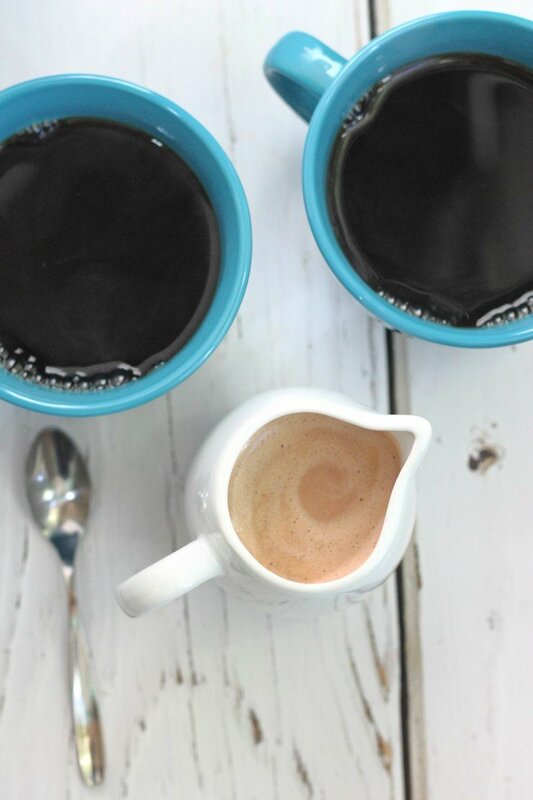 I don’t typically drink coffee but I know a lot of people who would enjoy this recipe! You are one of the few my friend! More power to ya!! Oh my. I need to make this for my hubby STAT. He would LOVE this! Looks delicious! I never want to spend money on creamers in the store, and I usually just like my coffee with milk. But this sounds so easy and delicious, I may be trying my coffee with it! The dairy free part is huge for me! Me too. Very few fancy-flavored creamers are dairy free! Who doesn’t love snickers? I would totally try this if I was following a paleo diet. I will share it with my friends! This looks amazing! I hadn’t thought to add dates to my paleo creamers. Just delish! Thrilled beyond words to find this recipe! 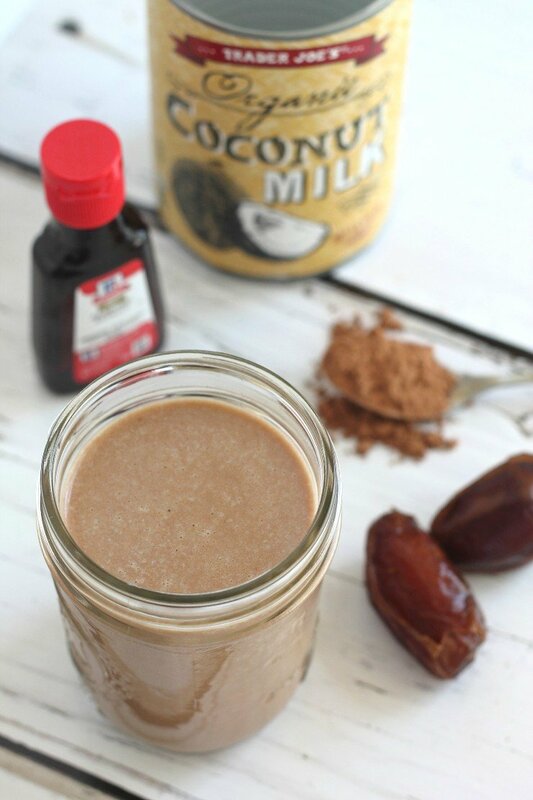 Paleo and vegan snicker’s creamer?! Seriously amazing! Oh my goodness I love this idea and the ingredients! I’ve made creamer with the coconut cream and dates, cacao and dates, and coconut cream and almond extract but never thought to put them together! This is genius, can’t wait to try it! Sounds amazing. I am going to try this soon. I’ve got to try this! I’m a coffee cream lover fanatic! on that note, i could go for a cup of coffee right about now. I’ve never been a coffee creamer fan – at least the store bought kind. But this one here I’d actually love to try!! Looks so good! Can’t wait to try this!! I am vegan and work at Starbucks so always looking for something new to drink and the fact that I don’t have to modify it at all is AMAZING. I should be taking creamer/coffee advice from YOU girlfriend! Love how easy and Whole30 approved this is, Chrissa! I’m going to try this recipe this weekend. I’m known to drink my coffee black because I don’t want the dairy or added sugar… this is a great way to sweeten things up! Hi Berniedette! I hope you love this gem! I DO like black coffee from time to time, but rarely 😉 I just need a little sweet in those morning hours! I’m not a coffee drinker. But this time of year I almost want to be with all the awesome creamers out there. I’d just be a creamer drinker and not a coffee drinker. LOL. It’s awesome you made a healthy version! I don’t use creamer in my coffee but I have friends that won’t drink coffee without it. They’re going to love this recipe. This looks so great! You’re right–I used to love the seasonal creamers until I looked at the ingredients! This is a great compromise and you could switch up what you add for different holidays! This sounds awesome! I don’t use coffee creamers because they store bought ones taste way too artificial and junky for me. But this!! I love that it’s made with real ingredients and is so easy to make!! I can’t wait to try this recipe this weekend. I totally agree!! I used to love the processed/package junk. Now I can’t stomach it. This is a great little treat without feeling icky afterwards! This looks really yummy and perfect for all my vegan and paleo friends when they come over! And it’s super easy to make! Thank you for sharing! YES! i have been looking for a healthier creamer option because i am addicted to coffee. actually I’m addicted to cream with a side of coffee. haha! Nice! I’ve actually never used coconut milk before, like ever. 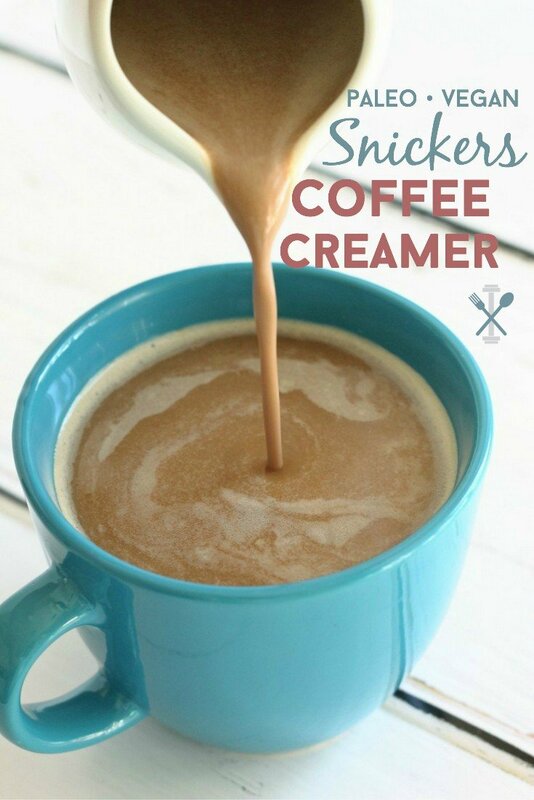 Thinking I need to buy some to try my own creamer! This is such a great idea! I love coffee creamers but hate all the sugar. Definitely going to make this – thank you. Whoa! This sounds like an amazing treat! I am going to have to try it asap and share with my vegan friends! This sounds amazing! Can’t wait to try this! I hope you do Greta! Oh my! I can not wait to try this. So simple but so delicious looking! YUMMY! Simple and delicious is totally my jam!! I don’t even drink coffee and this sounds amazing! Such a huge fan of snickers flavor! Oh this is your shin-dig even if you aren’t a coffee drinker Cara! So much deliciousness for one cup of coffee! YUM! One cup, five cups…but who’s counting?! I am not a huge coffee drinker, but I can bet my hubs and I will have to make some of our FAV Ethiopian coffee to go with this creamer! OH whaaa?! Ethiopian coffee? Do share where I can find this! Oh my god, I cannot wait to try this recipe! I love snickers! DO IT MY FRIEND! DO IT! I had to give the title of the blog post a double take. This would seriously take my coffee addiction to a whole new level! My mouth is already watering. I just made this, but also blended in about 1/4 cup pecans for a real pop of nuttiness… MY COFFEE IS DELICIOUS!!! Thanks for the recipe!! I stopped using coffee creamer a few years ago because of all the sugar and unpronounceable ingredients, however my morning cup of coffee has never been the same. UNTIL NOW. I tried this two weeks ago and am now on my second batch. I have been jumping out of bed each morning thinking about my morning cup of coffee with a splash of pure deliciousness. I didn’t even have to go to the store to buy the few ingredients as they are all staples at my house and it is so easy and quick to make. Thank you Chrissa! Heck YAAAAAS! That’s so awesome Emily! I tried this and I do like it, but does not taste like snickers to me . And not very sweet which is ok too. I just made this tonight for my morning coffee tomorrow. Of course I had to sample it lol. It’s so good & easy to make! I can’t wait to put this in my coffee! Love it! Ill be making this often! I’m glad you loved it Debra! This sounds great! I need to lighten it up a little, as I am doing weight watchers. Could I use a reduced fat coconut milk or even vanilla almond milk? Please let me know your thoughts! When I first made it, it was a liquid and smelled so good. I had made it the night before so I could have it for morning. I put it in a jar and into the fridge. In the morning I pulled out what appeared to be pudding. Even after allowing it to come to room temperature, it was still thick and pudding-like. I tried putting it in my coffee anyways and it didn’t really dissolve. Followed the recipe to a “T”. Hi Melissa – full fat coconut milk will solidify when chilled, that’s totally normal and explains why it was pudding-like. I put it in my coffee every morning and it’s the same state you are referring too, but if you stir it in there for 30 seconds, it will dissolve and give you the most creamy, dreamy coffee ever. But you must stir it well. If the consistency bothers you, try this recipe with lite coconut milk or almond milk – that won’t thicken once chilled like full-fat coconut milk does.